"I read this old archive report about the hardship brought to Barbaig community by Canadian Government, Canada is regarded as one of world's leading countries to hate human rights abuses! Barbaig community should reopen the case in the international court for retribution|"
In 1991 I was guided around the plains by a Barabaig man who had to hide beneath the dashboard whenever we passed a farm official, for fear of being dragged out and beaten. 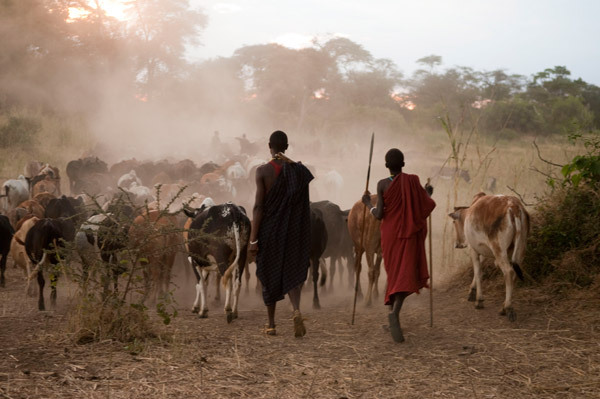 We drove first across a scrub of dark acacias and yellow grass, in which tall men and women in tasselled brown cloaks herded their cattle down to the waterholes. Then, crossing an escarpment, we passed into another continent: for as far as I could see there was nothing but hedgeless fields of wheat dotted with combine harvesters. We had left the savannahs of Tanzania for the prairies of Canada. Returning to the plains 17 months later, it was not hard to see that Dr Heuckroth’s promises had been broken. A pillar of yellow smoke rose from the savannah. Coming closer, I saw that trees were being bulldozed into piles and burnt. A Canadian tractor was pulling a plough up and down the cleared land. I asked the driver who he was working for. He told me that NAFCO was employing him to expand the farms. The villages in which I had met the remaining plains dwellers had disappeared: like the trees, the grass and the spirit mounds they had gone under the plough. I met a man who had been repeatedly beaten and electrocuted by NAFCO workers: his face was covered in scars and he could not raise his arms. Nine Barabaig whose cattle had died of starvation had been caught gleaning spilt grain in one of the fields and were each sentenced to three years in prison for stealing wheat. Some of the women caught by farm workers had been raped with sticks and then beaten up; the people were more desperate than they had ever been before.